It is critical to educate and provide training not only to people with disabilities and their caregivers, but also to emergency planners, first responders, and other members of the community who play an important role in making sure that people with disabilities are included in emergency preparedness and response plans. States have developed tools and resources to reach out to community members. Several states have available brochures, booklets, guides and other materials and tools that people with disabilities and their caregivers can use to prepare for an emergency. The Get Ready! Toolkit Cdc-pdf[2.62 MB, 65 pages]External: This toolkit helps people with disabilities prepare for an emergency. Making an emergency plan and putting together an emergency kit is a big job. A good plan may include family, friends, neighbors, and organizations that support people with disabilities and can help make decisions. Disaster Preparedness for Families of Children and Youth with Special Health Care Needs Cdc-pdf[11.9 MB, 24 pages]External: This guide takes parents through the basic steps of creating an emergency kit and developing a family communication plan. Emergency Preparedness for AllExternal: This 10-minute video assists people with disabilities and their families in preparing for a disaster. The video is signed in American Sign Language (ASL), captioned (optional), and voiced in order to be the most accessible. The 2016 emergency preparedness calendar and guide Cdc-pdf[1.17 MB, 39 pages]External: This calendar was designed with seasonal tips and activities to help people with disabilities become more prepared for emergency situations. Make Your Plan BEFORE a Disaster Cdc-pdf[1.18 MB, 24 pages]External: This product contains information on access and functional needs for use in developing agency or individual preparedness plans and working with local emergency management. This booklet covers the Communication, Medical, Independence, Supervision, Transportation (C-MISTExternal) planning guidelines to develop emergency plans for individuals with disabilities. Prep Iowans Program Cdc-pdf[1.30 MB, 27 pages]External: This program was designed to help persons with disabilities take the time before an emergency occurs to plan for survival at home, in a shelter, or elsewhere. This guide can be used to assist individuals with disabilities and their caregivers in developing personal emergency plans. The Preparedness Lifestyle. How to Plan for Seasonal and Pandemic Flu and Other Emergencies for People with Disabilities Cdc-pdf[467 KB, 12 pages]External: This booklet is designed to help people with disabilities prepare for all hazards, which include public health threats and natural or man-made disasters. Individual Disaster Preparedness Cdc-pdf[226 KB, 1 page]External: This poster, with a disaster do’s and don’ts checklist, can be displayed on shelters, business lobbies and other appropriate areas to indicate what people with disabilities can do to prepare for emergencies and disasters. Community Disaster Preparedness Cdc-pdf[210 KB, 1 page]External: This poster, with a disaster do’s and don’ts checklist, can be displayed on shelters, business lobbies and other appropriate areas to indicate how people with disabilities can work with their communities to obtain the support they need during an emergency or disaster. Emergency Medical Information (EMI) kitExternal: This kit was designed to improve communications about medical needs during a disaster. 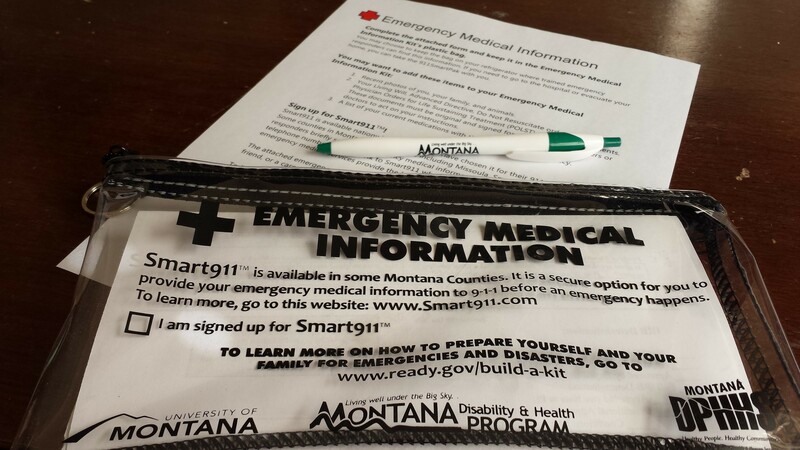 The kit also promotes awareness of Smart911External and offers support for people with disabilities who may need help creating their profiles, as well as provides information about available emergency preparedness materials. The kit materials include an Emergency Medical Information formCdc-pdfExternal, a plastic bagExternal to keep the form safe and let responders know the person has signed up for Smart911External, and a magnetic hook. Emergency Preparedness – An inclusive Guide for People with Access & Functional Needs Cdc-pdf[606 KB, 14 pages]External: The purpose of this resource is to improve communications that promote the involvement and safety of persons with functional disabilities during emergency preparedness, action, and recovery. Emergency Preparedness & You Cdc-pdf[606 KB, 2 pages]External: This is a brochure created to remind people with disabilities that disasters and emergencies can happen without warning, and it provides tips on planning and preparedness. C-MIST Personal Planning Tool Cdc-pdf[903 KB, 9 pages]External: This tool was created to assist people with disabilities in considering which specialized items to add to the personalized preparedness kit, available at ReadyNH.govExternal, and the tool guides them through the creation of a personalized Emergency Plan.” With “This tool was created to assists people with disabilities in considering what specialized items to add to an emergency kit, and guides them through the creation of a personalized emergency plan. You can visit New Hampshire’s emergency preparedness websiteExternal to learn more about their local resources. Emergency Preparedness: My Safety, My Responsibility, My PlanExternal: The New York Disability and Health Program partnered with the Westchester Institute for Human Development to promote this multi-session program to train adults with intellectual disabilities to understand and to be prepared for emergencies. Information is based on the principles set by the Federal Emergency Management Agency (FEMA), the Department of Homeland Security, the American Red Cross and the U.S. Fire Administration. In an Emergency, Will You Be Ready? This 5-minute emergency preparedness video illustrates emergency preparation steps that include developing a plan, creating an emergency kit, and discussing specific considerations for people with disabilities. Identifying emergency situations and hazards. How an emergency may change his or her abilities and independence. The importance of developing a personal contact list. Assembling a 72-hour supply kit of food, water, special medications, and personal supplies. Preparing pets and service animals for emergencies. The importance of regularly updating emergency preparedness plans. This guide is also available in Spanish Cdc-pdf[9.54 MB, 126 pages]External. Emergencies, Disasters and your Assistive TechnologyExternal: South Carolina Disability and Health Program has provided emergency preparedness training to people with disabilities through their Independent Living Centers, the Spinal Cord Injury Association peer support groups, and Aging and Disability Resource Centers. The slides from this training are available for others to use. States have available materials and presentations that have been used to train emergency management agencies on how to develop plans that address the needs of people with disabilities in emergencies and disasters. Access & Functional Needs Injects Flip Flops Cdc-pdf[1.42 MB, 24 pages]External: These are disability related materials for use by local emergency planning personal in emergency exercises and drills – based on listening sessions with people with intellectual and developmental disabilities, their family members, and emergency responders. A Whole Community Approach to Disaster Planning and Management Cdc-pdf[1.13 MB, 29 pages]External: This training is provided to county emergency managers and planners on identifying disability resources to improve communication and transportation for individuals with disabilities during a disaster. Emergency Planning for People with Disability Cdc-pdf[691 KB, 38 pages]External: Emergency managers, local public health agencies, and other community providers use this training to understand the needs of people with disabilities during emergencies and prepare and respond accordingly. Montana’s Community County ProfilesExternal: After assessing the needs of people with disabilities in the state’s counties, Montana’s Disability and Health Program shared results with emergency managers to help them improve their emergency plans and address the specific needs of their communities. Including People with Disabilities in Emergency Planning and Preparedness Cdc-pdf[1.34 MB, 32 pages]External: This is a resource packet for state and local emergency management personnel or others involved with the planning or provisions of emergency operations. These resources were used to create a catalog of training modules Cdc-pdf[2.50 MB, 32 pages]External from which local and regional emergency personnel could select a customized menu of topics to be covered in in-person trainings. Disability Training for Emergency Planners: Serving People with DisabilitiesExternal: This training includes a video that provides information and best practices that help emergency planners ensure the safety of people with disabilities and their own safety during emergency events. Planning for Disasters with People with Disabilities Cdc-ppt[Right click and select “Save As”]External: This material for professional planners and disability organizations advises them on why it is important to integrate people with disabilities into disaster planning and how to do so. First responders know well how to act during emergencies and disasters. However, they may need additional training to address the specific needs of people with disabilities. Tips for Providing Services for Individuals Living with Functional & Access Needs: Cdc-pdf[4.23 MB, 2 pages]External This brochure offers valuable tips for providing services for individuals living with functional and access needs. Hidden Disabilities: Communication Tips for First Responders: This training video was created by a group of community partners to teach first responders how to communicate with people with different types of disabilities. Tips for First RespondersExternal: Simple, easy-to-use tip sheet with information for assisting people with a wide range of disabilities. Originally developed by the University of New Mexico’s Center for Development and Disability, this tip sheet is now being distributed around the country by other State Disability and Health Programs. Disability Training for First Responders Serving People with DisabilitiesExternal: This training includes a video that provides information and best practices to help first responders ensure the safety of people with disabilities and their own safety during emergency events. Serving Service Animal Team: This video developed by the Ohio Trauma Committee Functional Needs Work group teaches first responders how to handle service animals in emergency situations. Engaging People with Access and Functional Needs during Disasters Cdc-ppt[Right click and select “Save As”]External: This training was provided statewide to Community Emergency Response Teams (CERT), Medical Reserve Corp and other first responder organizations. It has information that first responders can use to respond to the needs of people with disabilities during a disaster or emergency. Topics include considerations on how to reunite people with disabilities with their loved ones, keeping equipment with individuals, and how to develop creative strategies to help communicate and provide access to resources. Community-based organizations, such as Centers for Independent Living (CILs), Aging and Disability Resource Centers (ADRCs), and other entities that regularly provide services to people with disabilities need to know how to plan for emergencies and disasters. Overview of Emergency Management for Disability Programs Cdc-pdf[366 KB, 19 pages]External: This training curriculum developed for community members, such as service providers for the elderly and people with disabilities, Centers for Independent Living staff, and local emergency managers, has information that will lead to cooperative planning and appropriate response. Whole Community Approach – Emergency & Disaster Preparedness Cdc-ppt[Right click and select “Save As”]External: This material can help community-based organizations fulfill their role on making sure people with disabilities are well informed and have the resources they need to stay safe during emergencies and disasters. Creating Emergency Kits and Plans with People with Disabilities Cdc-pdf[1.50 MB, 48 pages]External: This interactive training curriculum teaches staff from disability organizations, family members, and people with disabilities how to be personally prepared for emergencies. During the training, participants review basic, modified, and specialized emergency supply kit items, and learn how to use the C-MIST Personal Planning Tool Cdc-pdf[903 KB, 9 pages]External to make individual emergency plans. North Dakota’s Disaster Preparedness Cdc-pdf[1.60 MB, 87 pages]External: This emergency preparedness training can be used by Centers for Independent Living and other healthcare providers to make sure that people with disabilities are prepared for emergencies and disasters. Emergency Preparedness for Vulnerable Populations: Cdc-ppt[Right click and select “Save As”]External North Dakota Disability and Health Program provided training to community-based organizations to help them respond to the needs of people with disabilities during disasters and emergencies. Slides from this training are available on the program’s websiteExternal.